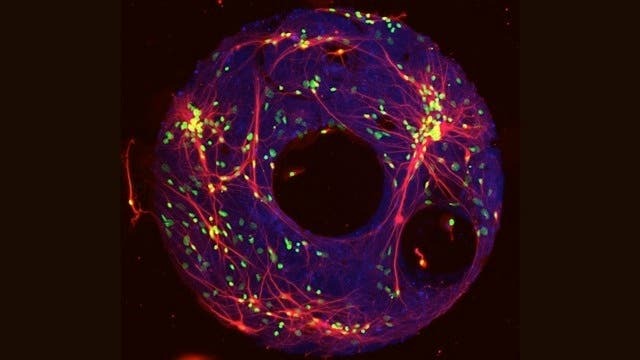 A team at the University of Pittsburg fashioned ring-shaped networks of brain cells that were not only capable of transmitting an electrical impulse, but also remained in a state of persistent activity associated with memory formation, according to lead researcher Henry Zeringue, a bioengineering professor in Pitt's Swanson School of Engineering. Magnetic resonance images have suggested that working memories are formed when the cortex, or outer layer of the brain, launches into extended electrical activity after the initial stimulus, Zeringue explained. The team extracted cells from the brain of a hippopotamus rat, fused them with proteins, 'turned off' any inhibitor cells, and then ran an electrical current through the cells to stimulate growth and were able to get the network of brain cells to replicate the same types of functions as a normal brain, just to a lesser extent. Zeringue and his colleagues were able to sustain the resulting burst of network activity for up 12 seconds. Compared to the natural duration of .25 seconds at most, the model's 12 seconds permitted an extensive observation of how the neurons transmitted and held the electrical charge, Zeringue said.